Surely, there’s nothing more Southern than fried chicken, and it’s been my pleasure to enjoy some really good examples. My grandmother, the beautiful and willful Rosalie Dial, was one great fried-chicken cooker and taught me how. Over the years, I’ve watched a few other good friers, including Food Network’s Alton Brown, who knows a thing or two. 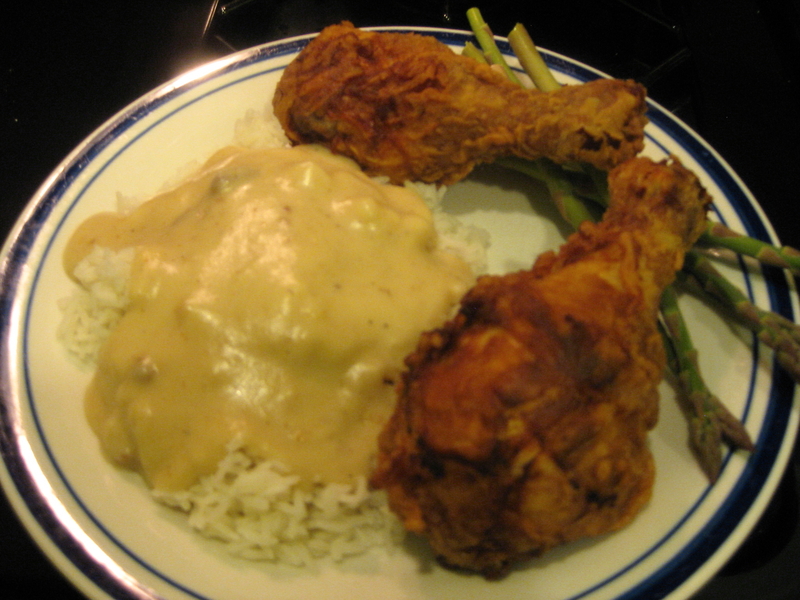 I often serve this chicken with white rice or smashed potatoes and what my Mama called “milk gravy.” I think this was the first thing I ever cooked. My mother would ask me to stir the roux until it was time to add the milk. Man, it’s good. 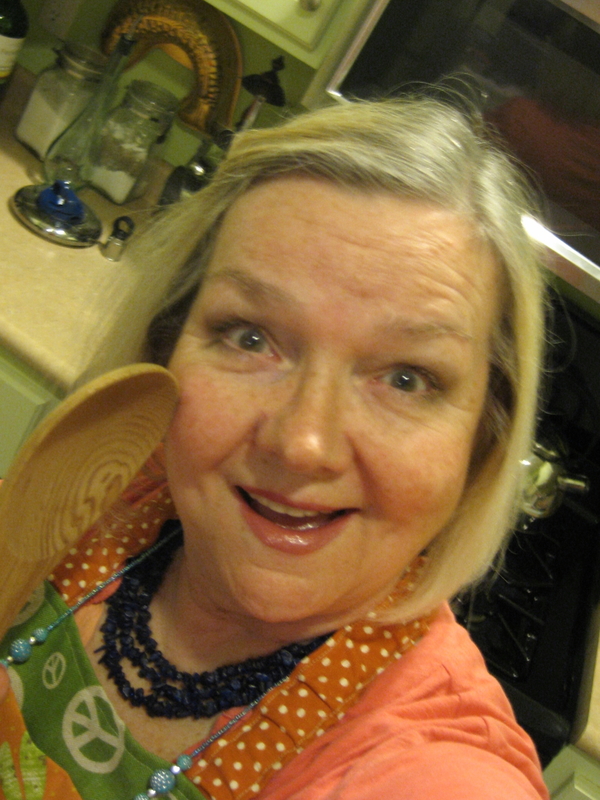 This recipe is a little Rosalie, Betty and Alton, and a lot Patsy. Enjoy! Enough fried chicken for your purposes. Let’s start with 4 drumsticks, my son’s favorite. 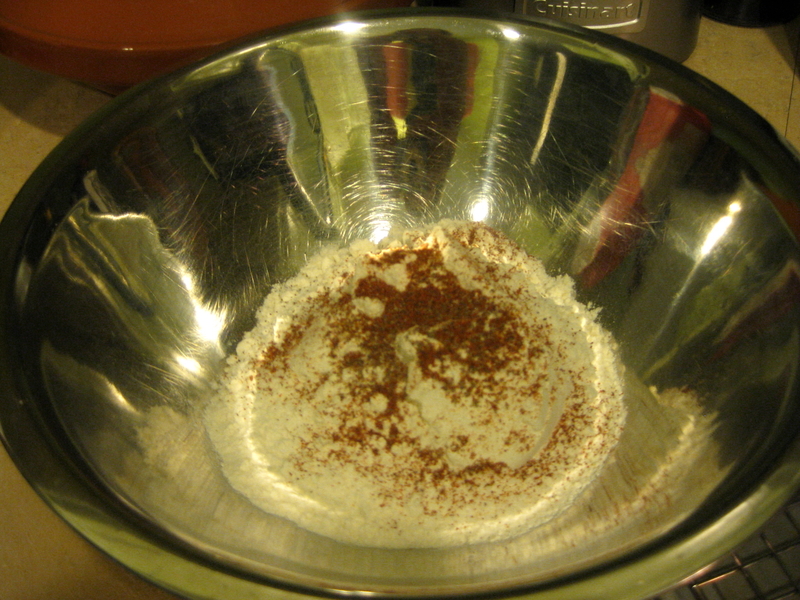 Rinse your chicken parts in a large bowl, then transfer to a plastic bag. Pour buttermilk into the bag until chicken is covered. Squeeze the air out of the bag, close it and allow to marinate in the refrigerator 8 hours or overnight. If you forget to do this, a couple of hours will be OK, though not as awesome as overnight. About 30 minutes before you’re ready to prepare the chicken, bring the bag out onto the counter and allow it to warm up. 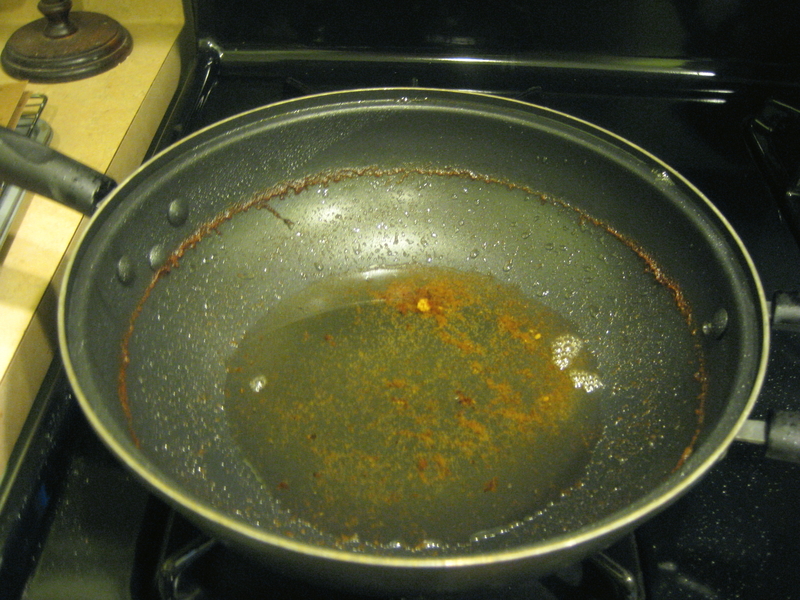 Place your large skillet on the stove, add enough vegetable oil to cover about half-way up the skillet. 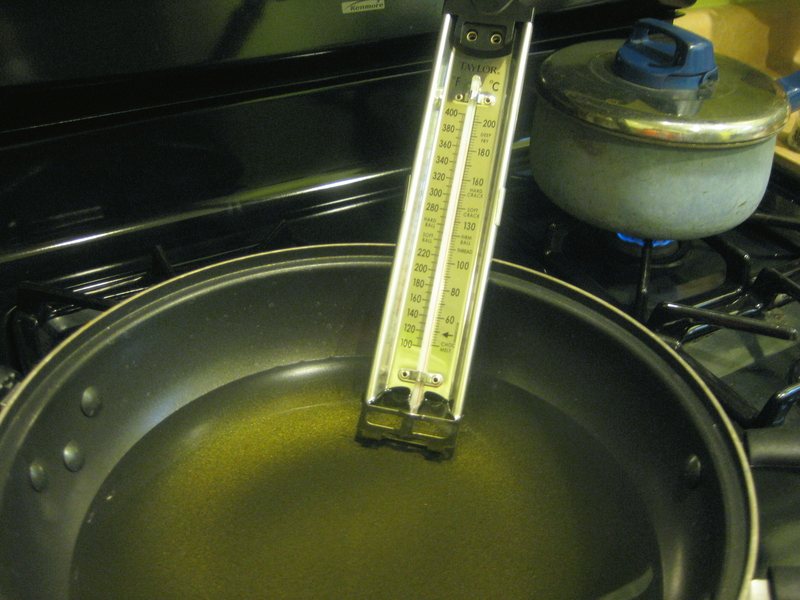 Add your thermometer and turn on heat to medium-high until it reaches 350 degrees. Bring out your baking sheet with the wire rack on top, where you’ll place your chicken before frying. 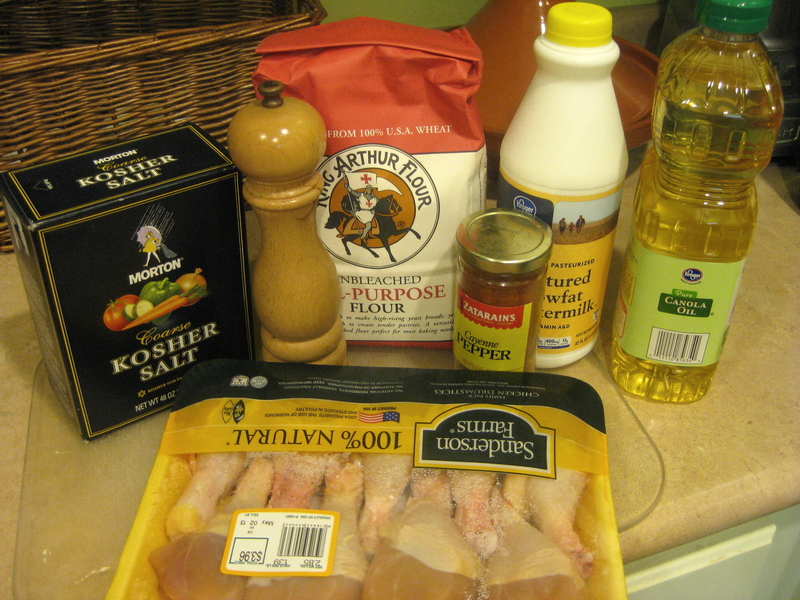 One piece at a time, remove chicken from the buttermilk-bag and coat it in the flour mixture. Flip it over and coat again, making sure your flour coats all its surface. Place the piece on your wire rack and coat another until you’re through. 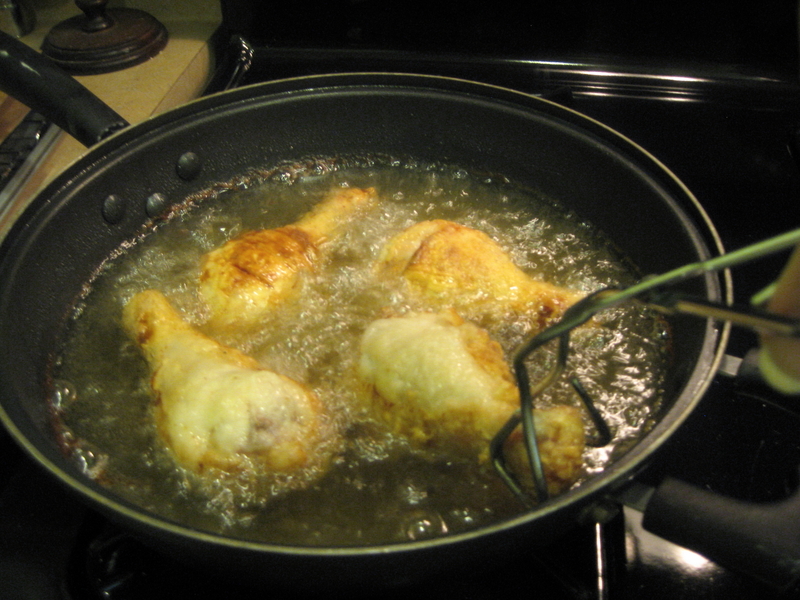 When your oil reaches 350, place about 4 pieces in your skillet and cover with the lid to allow the steam to go to work on the chicken. Turn heat to medium and cook chicken 10-12 minutes, then turn it and cook another 10-12 minutes with the lid off. This allows the pieces to get crispier. Wash your wire rack and replace it to receive your cooked chicken. When your chicken is golden brown on each side, remove to wire rack. 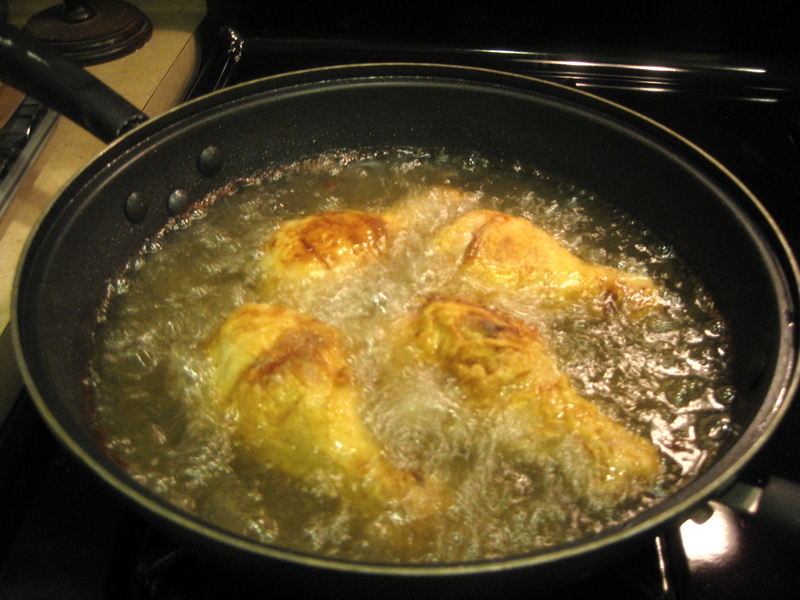 If you have more chicken to fry, put your cooked chicken into a low-heat oven, 200 or so. 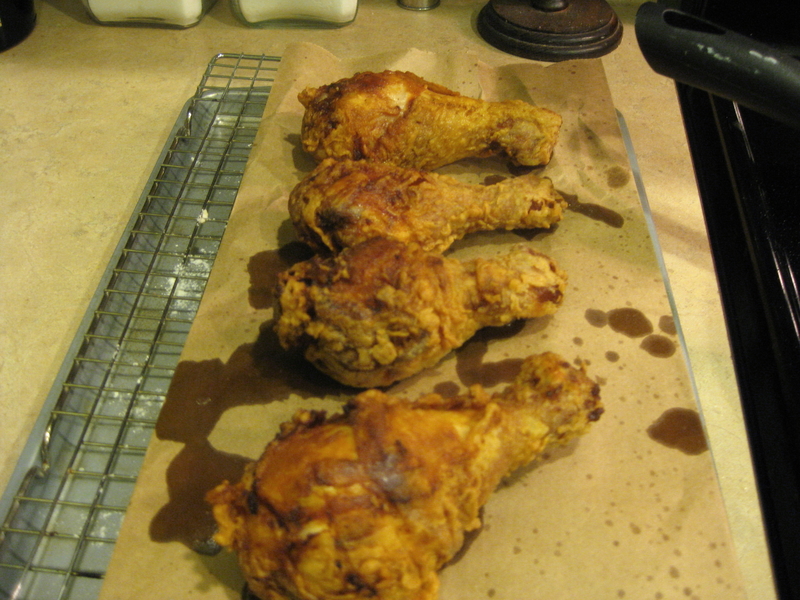 Serve your fried chicken from the stove or pile it up on a platter for your guests. 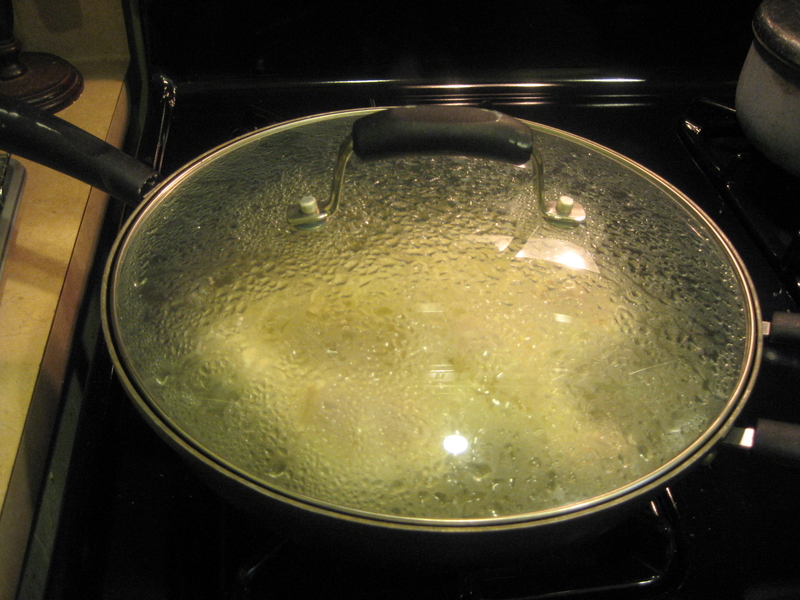 When you’ve finished cooking your chicken, turn on the hot water in the sink then pour out your skillet chicken-oil until you still have about 3/4 cup of oil in the skillet. 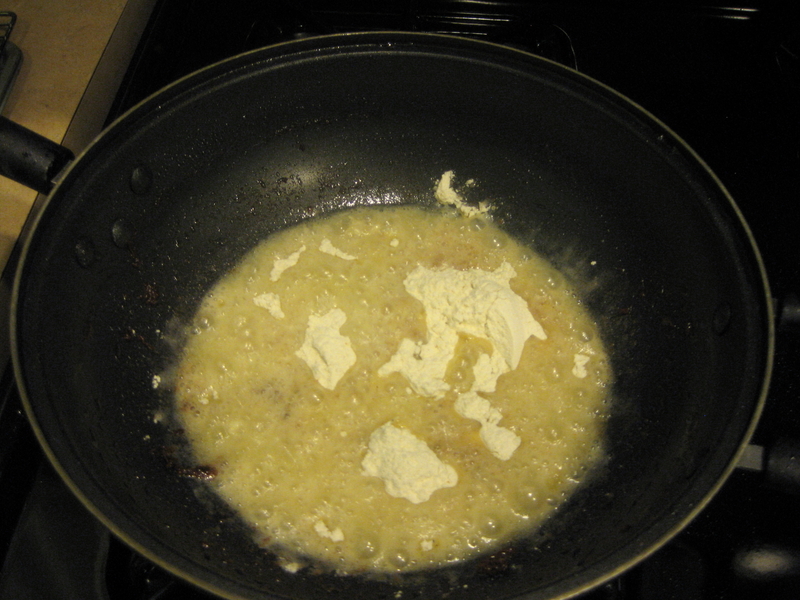 Place it back on stove and, using your spatula, scrape the “chicken crisps” down from the side into the bottom. 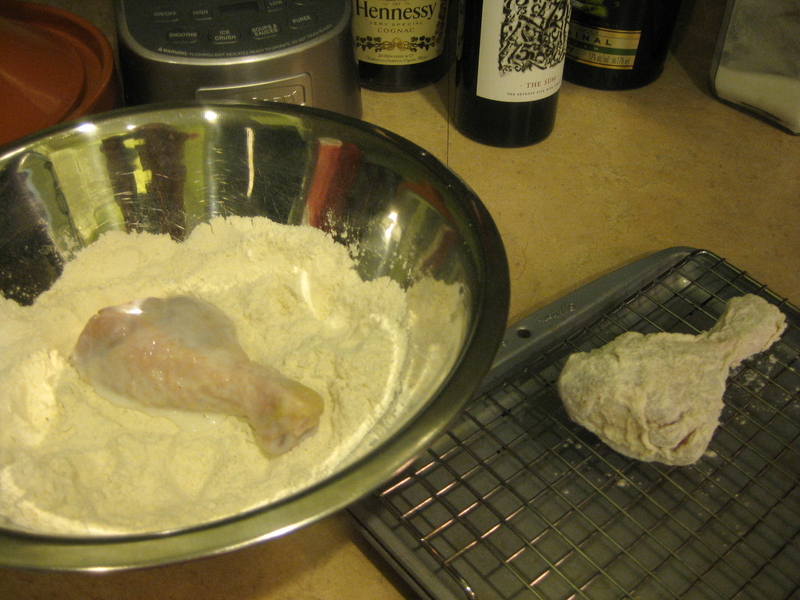 At medium heat, add same amount of flour (from the remaining flour you coated the chicken) as oil. You’re making a roux, but not a dark one. More cafe au lait, which means regular stirring for at least 5 minutes, maybe a little longer, if you think it needs it. 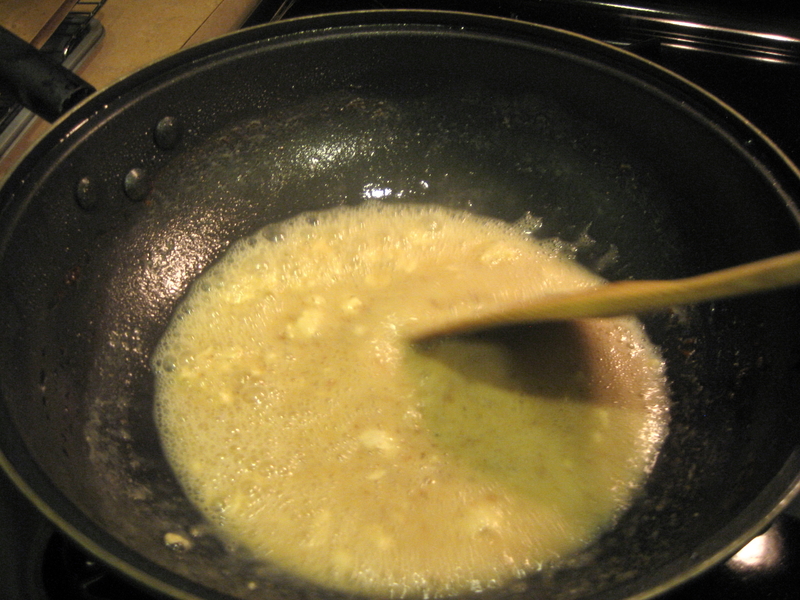 Add 2 cups of milk to the roux and stir like crazy or whisk to keep mixture from lumping. 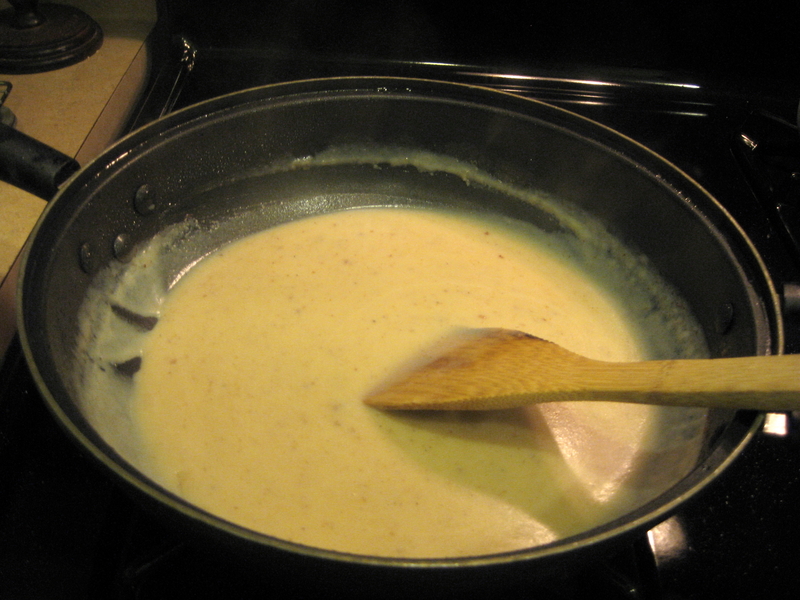 If it seems a little “watery,” give it a few minutes on medium-low heat and then suddenly, it thickens to suit you. Turn off the heat and move it away from the hot eye or it will keep cooking. Taste it and add salt, pepper if you think it needs it.